Faces stare out from a two-dimensional black and white. They are laughing, posing, cast in shadows and cut-and-pasted beside lush palm trees, neon hummingbirds, tan thatching and pinkened skies. Sometimes they smile; other times they gaze off, someplace beyond the camera, looking out from thin layer of time and plastic. And I am completely obsessed. 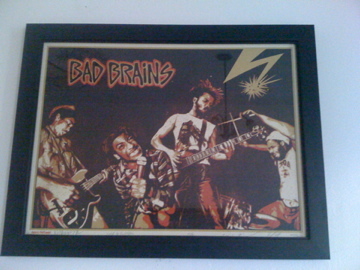 It’s my weirdest and raddest score from the Bay Area’s rummage event of year. The annual Oakland Museum’s White Elephant Sale is a cult event local collectors, scavengers, cheapskates and lovers of vintage live for. The Oakland Museum benefit is held out in a Jingletown warehouse, and hosted by the spunky white-haired ladies of the Women’s Board. 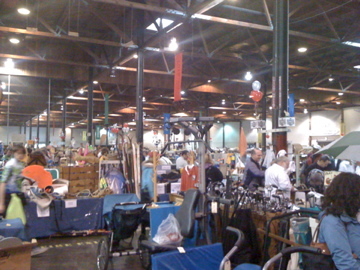 Donations are collected throughout the year, culminating in the kitschy bonanza of bargains. The event takes over the neighborhood, complete with taco trucks and a free shuttle to the BART station. While the main event is a two-day affair held on the first weekend in March, this last Sunday was the special preview—when the die-hards shell out $10-15 months in advance to get first pickings. A friend finagled us onto the guest list; we traipsed down across the train tracks, through the sour estuary smell and into the warehouse bustling with bodies digging for treasure. I scored a couple cool vintage-y household items, but by far the coolest thing I came across was a 20″ x 16″ photo collage. It’s cheaply framed, cost $1 and is full of the kind of mystery that gets my wheels turning, my imagination shooting sparks. 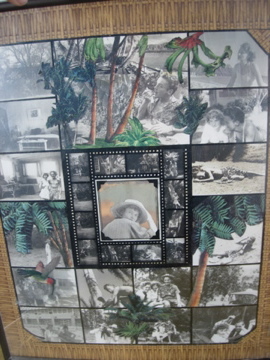 The artfully executed collage of photos is from a group of young people’s vacation to Honolulu. The handwritten note on the cardboard back guesses the year to either be 1939, or 1940-43, World War II. Beneath that, four names appear: Virginia Matthiesen, Cole McFarland, Bud Matthiesen and “Sailor Friend.” Those are the only tangibles I have to cling to, the only ones I want. In the grey photos of shorelines and hotel rooms, a garden and a roadside, I have all the fodder for fantasy I need. The group is young, mid-20s I’d guess. They have the eyes and expressions of old-school rebels, a kind of pre-Beatnik vibe, something carefree and a little wild in their smiles and poses. One has a Neal Cassady look; a girl has sharp cheekbones and piercing eyes; another stares off from above bare shoulders and a shell necklace. 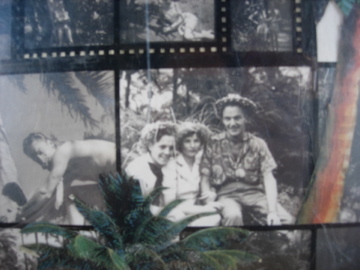 In a different photo, Neal Cassady is wearing the shell necklace, leaning in towards the girl as she looks away. The light has caught her blouse, making it blaze with a whiteness that obscures her face. There’s an impossible number of stories inside the collage, silent and lost like a dream you can’t remember. Whoever made it set it in a border of tiki-style thatch print, then pasted a couple cut-outs of palm trees, to add color and a tropical vibe. It’s visually cool and kitschy enough to be hip. But really, it’s the faces that make me love the collage. Of course, I’m projecting all of this—maybe they’re not artsy rebels at all. 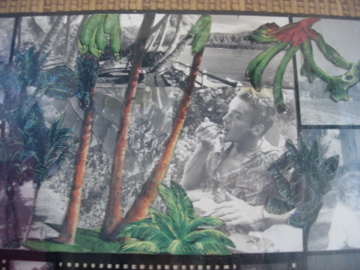 But that’s the fun of it, imagining a trip like that, then: how long it must have taken to get to Hawaii, how rustic and undeveloped it looked, how more pointed and romantic everything looks in black and white. And the timelessness of getting into adventures on the road. I haven’t found the perfect place for it yet; one of my roommates loves it, the other thinks it’s creepy. For now, it’s leaning against my bedroom wall, where I can stare and dream. 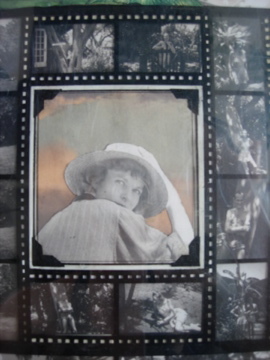 At the center of the collage, pasted on a pastel sunset, is a solo shot of the sharp-cheeked woman. She’s looking back, over her shoulder, holding a straw hat down against what might be wind, what might be the passage of time. I like to think she’s looking back at me, out from a moment that’s long passed, a place that isn’t the same, a youth that is gone. Probably, she was looking back at one of the boys in the collage. But a girl can dream, can’t she? How Many Dyslexics Does It Take to Rewrite the Travel Rules? Well, actually, you’d need at least one non-dyslexic to transcribe the edict. But that’s not the point, at least not of my latest article on BootsnAll, which explores untraditional travel techniques I’ve learned from my brother. Aaron’s a severe dyslexic with a disarmingly positive outlook and tireless work ethic that’s enabled him to do all sorts of difficult things—things most of us take for granted. This includes traveling. Imagine trying to decipher a foreign language when letters mischievously switch themselves, or trying to understand unusual sounds through an auditory processing system full of static and interference, with all the wires crossed and smoking. Enough to make you want to stay at home, huh? But for someone with such seemingly insurmountable obstacles inhibiting him, Aaron’s managed to get on the road a fair amount; he just hasn’t done the usual guidebook, itinerary, sight-seeing kind of travel. He’s traveled home with friends from Cuba and Guatemala, traveled up the West Coast into Canada, arrived reservation-less in New Zealand. An incredibly outgoing person, he’s relied on his own gregarious personality to get him along, rather than the clutches a lot of travelers lean on. 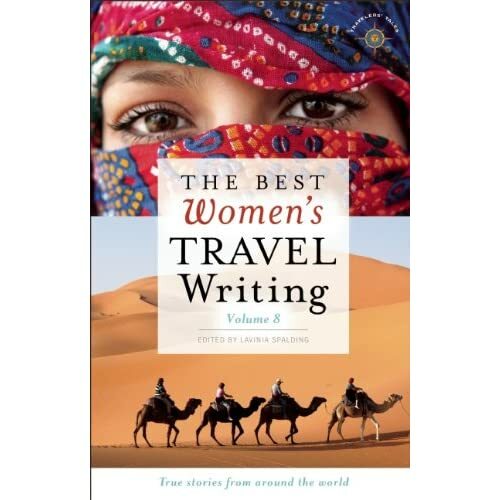 I’ve tried to incorporate his seat-of-the-pants approach to travel into my own Lonely-Planet-endeared style, and the article was my attempt to share those lessons with other travelers. The Editor at BootsnAll wanted me to go light on the dyslexic angel, and that’s understandable: it’s not something a lot of people relate to, and they want to publish articles with compelling titles that generate page views. And the article met a largely positive reception from readers. But there’s always that one comment, that one nay-sayer, and this time, I’ve got to say, I could see her point. I realized that, for me, the real story wasn’t the travel tips, but my brother. My whole life I’ve watched him struggle to do things that were absurdly easy for me: writing essays, reading text books, enjoying novels. His determined, un-self-pitying efforts to intellectually engage as an adult have continued to inspire me. His natural curiosity led him slug through Open Veins of Latin America, not light material for anyone, let alone a person at a 6th grade reading level. He watches subtitled movies three times—once to just absorb the images, a second time to pause and read all the subtitles, and a third time to weave it all together. Yes, he travels, but he also makes it through daily life, and usually with a giant grin on his face. Travel’s about a lot of things, and one of them is inspiration. It can come from a variety of places, in totally unexpected forms. And beyond trying to get off the guidebook and ditching the streetmap, my brother’s inspired me to push myself beyond what I think is possible for myself. And that includes, for me, traveling. So that’s the almost-as-long-as-the-article backstory; you can read the actual story here.